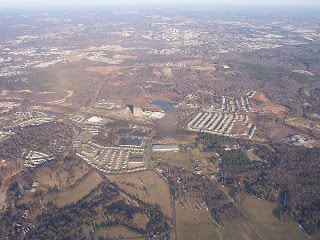 This picture to the right is one I took last month as I was flying into Charlotte, North Carolina from Milwaukee, Wisconsin on my way back to Germany. I like the picture and I currently have it on my computer desktop, this picture also gave me an idea for a blog about the problems we face in life. Everyone deals with problems and difficult issues from time to time. There is no escaping the fact that we all have challenges in life. Although we can not always control everything that comes our way we can control how we handle the situation and what we choose to do about the problem. When you are flying in an airplane and you look out the window everything looks so small. In reality the houses and other buildings you see are large enough for several people to fit into but from the point of view you have while flying over them they look very small. If we look at our problems from our natural perspective or point of view they can look so big and overwhelming. I like the verse in Psalm 2:4 where it talks about God laughing at the evil plans men have because He knows they can't succeed. The other verse of Ephesians 2:6 talks about the position we are now in spiritually because of who we are in Christ. Christians are spiritually seated with Jesus in a position of authority because of His death, burial, and resurrection. So, if we look at things from our spiritual position of being seated with Christ it is easy to laugh at whatever problem shows up. If we look at the problem in the context of who we are naturally and what we can do we might want to cry! No matter what we face in life we always need to see what the Bible has to say about the situation. If we only focus on the natural issue that we face, how we feel in the situation, and what others say we can become discouraged and feel like there is no solution. When we keep a heavenly perspective it is easier to see what we need to do about the problem. Everyone faces problems but it is the people who have the proper point of view who will live the life of victory that God wants us to have and that Jesus came to provide for us! We like the Bible here too. Thanks for your faithful posting. Thanks be to Jesus Christ for the Victory!